A simple Jaw Bone Infection is quite common, but thankfully most infections in the jaw are usually treated quite simply with standard antibiotics. After all, bone infections of the jaw are usually caused by bacteria, and so antibiotics can frequently kill the infection. BUT sometimes, an infection in the jaw bone can become more difficult to treat, more stubborn and more aggressive. This can happen when your immune system is compromised, (when your immune system is "down" for some reason), for example if the blood flow to the jaw bone is limited or reduced for some reason. What types of jaw bone infection might you get? What are jaw infection symptoms? How do you know if you have a serious infection that needs treatment? First, we need to look at what different types of jaw bone infection you could get, and the jaw infection symptoms to look for. There are FOUR types of infection. 1. Simple jaw bone infection; where there is a small infection on the tip of a tooth that has died. This is very common, and stays localised around the tip of the root. Symptoms? The tooth will usually be painful to bite on, and you may get a swelling on the gum. 2. Osteomyelitis; this is a much more serious infection, and it involves the bone marrow deep in the middle of the bone. Osteomyelitis can occur in the large, long bones of the body, such as the thigh bone (femur), but it can also happen in the jaw bone. When it does, it invades the bone beyond the tooth roots. It tends to occur AFTER a tooth has been extracted, or sometimes after a traumatic event such as a road traffic accident. The symptoms of osteomyelitis include severe pain and an open sore that does not heal. 3. Osteo radio necrosis; This is a very serious condition where the bone in the jaw has lost its ability to resist simple infections, due to radiotherapy (radiation treatment) for jaw cancer. The main jaw bone infection symptom here is a long-standing wound (usually after an extraction) that does not heal up. 4. Bisphosphonate osteomyelitis; This is a similar condition, but this time the bone has reduced resistance to infection due to bisphosphonate treatment for osteoporosis. Bisphosphonates are commonly prescribed by doctors to help prevent major bones becoming weaker due to age-related osteoporosis. A jaw bone infection like those listed above is MORE SERIOUS in several ways from bone infections in other bones of the body, like the thigh bone (doctors call them "long bones"). 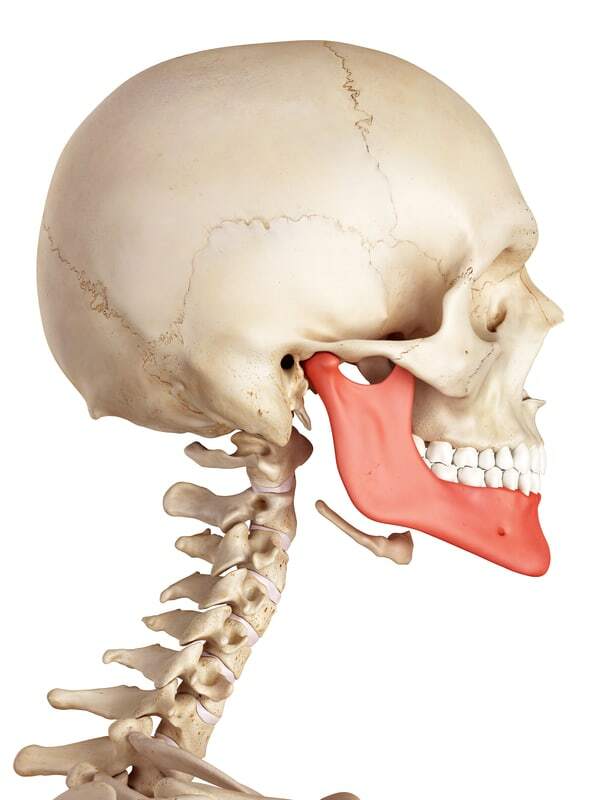 The bone in the jaws is special, different from other bones in the human skeleton, due to the relatively compact dimensions, complicated structures it contains and the close proximity of complicating factors like teeth, nerve canals and sinus spaces. If you are having pain in your jaw, and you think it MIGHT be an infection, I recommend you should also look at Jaw Bone Pain to find out about OTHER possible causes of pain in your jaws. SO, let's take a look at these different jaw bone infections one by one. On the image above you can see that the tooth on the right-hand-side of the photo is smaller than the other 2 visible teeth. That's because it's a baby tooth (a "deciduous" molar). 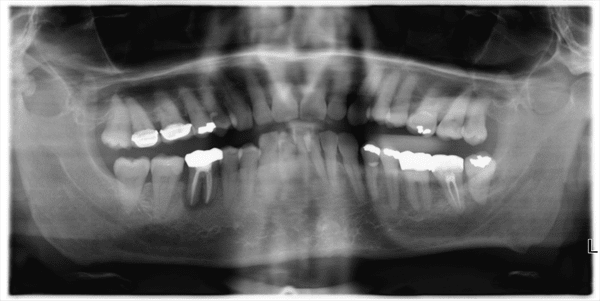 THAT MEANS that the patient here with the molar jaw bone infection is between 10 and 12 years of age! That's young, to be needing a molar root canal or an extraction. This is really more correctly described as a dental infection. It comes from the infection in the tooth, but it has spread to the jaw bone at the tip of the root. 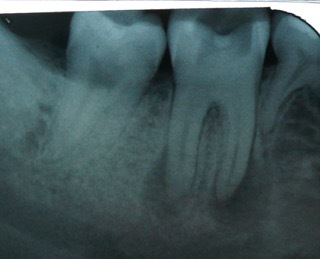 It usually stays close to the root tip, because the SOURCE of the infection is INSIDE the tooth. In this scan X-ray above, there is a jaw bone infection around a molar on the lower left side of the image (as you look at it). This is getting to the stage where the infection is spreading from the infected tooth out into the jaw bone. If it causes some swelling of the gum then it can be called an abscess. There are 2 possible treatments for this situation - remove the tooth, or try to save the tooth with root canal treatment. Read more about this at Alternatives to root canal. Sometimes, a short course of antibiotics will be needed, to take the swelling down before any other treatment. Recent research (2017) suggests that it's only necessary to take antibiotics until the pain and swelling are gone. Maybe 3 days or 4 days. Taking antibiotics for LONGER does NOT bring any more benefit, and may lead to "antibiotic resistance". Take a look at my page about Abscess Antibiotics for more information. A simple infection around a tooth root can occur on any tooth, in the upper and lower jaws. 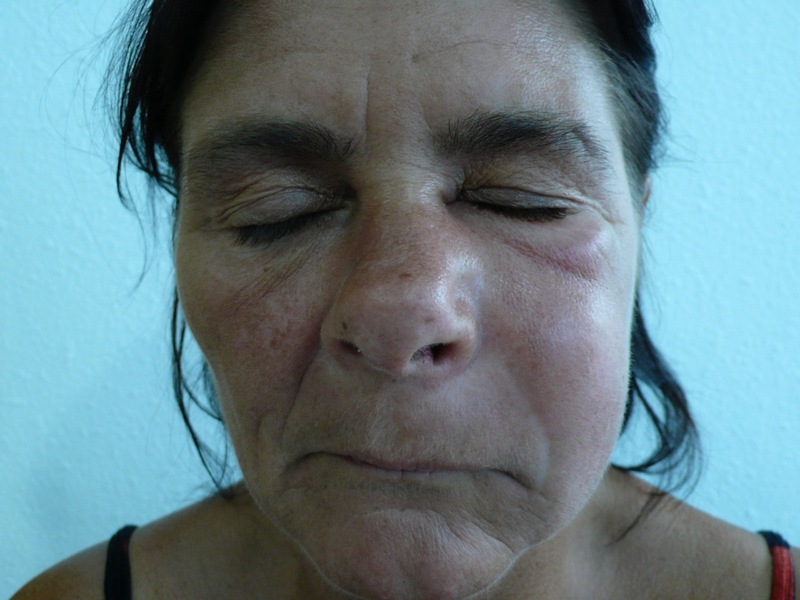 It may cause a swollen face, like the photo below. This can look very worrying if t swells up a lot, and it's a sign that the infection is out of control, and has spread to the soft tissues. 2. Osteomyelitis. This is a SERIOUS infection in the jaw bone that is not in direct contact with a tooth. The infection MAY HAVE STARTED on the root of a dead tooth, but in osteomyelitis it has spread away from the tooth root, to infect the neighbouring bone marrow. This is the most common cause of osteomyelitis. The other cause of osteomyelitis is infection from a traumatic jaw bone fracture, usually where the overlying skin is torn or the gum inside the mouth is ripped by the broken bone. This lets bacteria on the skin surface or bacteria from the mouth get into the traumatic wound. Osteomyelitis occurs more frequently in the LOWER JAW. This is because the upper jaw has a better blood supply, and the bones are thinner. The better blood supply means that your immune system has a better chance of getting into the infected area and fighting any infection. The thinner bone of the upper jaw also means that infections can get to the bone surface more quickly, and break out into the soft tissues, and drain out through the gum - or sometimes through the skin over the jaw somewhere. This is good. The infection has less chance to build up. In the lower jaw, the general blood supply is less good, so infection has a better chance of getting established. Also, the surface bone of the lower jaw is quite dense and tough. Once an infection gets going, it can expand within the inner space of the lower jawbone, and is contained by the tough and dense surface bone. What happens then is that pus from the infection builds up, putting pressure on blood vessels and reducing the blood supply (which was poor in the first place). Next, the main nerve running inside the lower jaw bone gets compressed, causing "pins and needles" or even numbness in the lower lip and chin on the affected side. Treatment is with antibiotics. A sample of the pus needs to be tested so that the correct antibiotic is used. This may change as treatment progresses, as the bacteria involved may change. Sometimes surgery is required to remove dead bone, and allow new bone to re-grow. If this happens, the jaw bone is quite weak for a while until re-growth is complete. Patients must avoid excessive pressure or trauma as the jaw could fracture more easily than usual. Finally, oxygen treatment may be used ("hyperbaric oxygen"). This is basically breathing and bathing the area involved in very high percentage oxygen. Our normal breathing air contains around 20% oxygen; increasing this concentration has been shown to be very effective in helping infected wounds to heal. 3. Osteo radio necrosis. This is normally written as one long word, but I have written it broken down into the three words that describe the condition. It is a condition of the jaw bone (osteo) caused by radiotherapy for cancer (radio), where the bone dies (necrosis). This is bone death. When a tumour around the jaws is treated with radiotherapy, the radiation destroys some of the very small blood vessels within the bone. Remember, the lower jaw has a relatively poor blood supply to start with. If enough of the small vessels are destroyed by radiation, then less oxygen and nutrients can get through to supply the living bone. Generally, the jaw bone can get by, as long as nothing else happens. BUT there has been a significant reduction in the bone's ability to heal. If there is some infection or some trauma to the jaw bone, such as gum disease or tooth extraction, bone is easily infected and dies. Bone death. The best treatment for this condition is prevention. This means that if a person is scheduled for radiotherapy to the jaw bones, they must be screened beforehand for gum disease, and any questionable teeth must be removed BEFORE the radiotherapy treatment. If osteoradionecrosis gets a foothold, antibiotics are usually useless, because there is not enough blood supply to the area to carry the antibiotic where it is needed. The first line of defence is hyperbaric oxygen treatment. This saturates the area affected in oxygen, aiding the bone to heal. The high concentration of oxygen helps to stimulate new blood vessel formation and growth. After hyperbaric oxygen treatment, the area involved must also be treated surgically, to remove dead bone which would otherwise be a centre for later infection. Again, the lower jaw is much more commonly affected than the upper jaw, and most cases occur within 3 years following radiotherapy. 4. Bisphosphonate osteonecrosis. This is a relatively rare condition, where bisphosphonates (i.e.. Fossamax) are prescribed for osteoporosis or Paget's disease of the bone. The lowest risk is for patients who have only taken bisphosphonates orally (by mouth) as opposed to by injection (intra-venously); ALSO it's very rare in patients who have not had cancer. The highest risk patients are those who have had cancer treatment, AND received bisphosphonates by injection for longer than 2 years. Other factors that increase risk are gum disease, mouth infections, diabetes, old age, and some other chronic disease status. Tooth extractions must be avoided as far as possible. Bisphosphonate osteonecrosis is a genuine jaw bone infection, and therefore can be treated with antibiotics. If a tooth must be extracted in a patient with a history of bisphosphonate medication, a high dose of antibiotics should be given BEFORE the extraction and for up to two weeks afterwards. JAW BONE INFECTION? What are the symptoms? pus oozing from a sore around the jaw line. 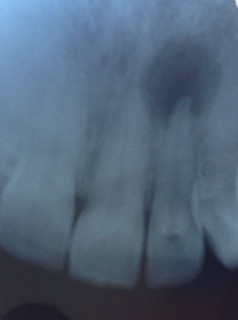 Some teeth becoming loose or wobbly. Numbness or "pins-and-needles" of an area of the jaw. Bone-hard swelling of the jaw. Pain in the jaw across an area of several teeth. If you have had a tooth extracted recently, or suffered a traumatic injury to the lower jaw, then you should be suspicious if you have 2 or 3 of the 5 signs listed. HOW CAN A JAW BONE INFECTION BE TREATED? 1. Prevention, by improving oral hygiene and treating gum disease. 2. Removing any doubtful teeth as soon as possible. 4. hyperbaric (ie. concentrated) oxygen therapy. You can read more about improving your oral hygiene at my page on How to cure gum disease. I hope my guide to jaw bone infection symptoms has been useful. If you think you may have a jaw bone infection, you should see a dentist as soon as possible. OR go to your nearest ER. Here is a link to an article about jaw bone infection by Johns Hopkins Medical Center.